Natural semiprecious stones hand shaped & inlaid in this beautiful Octagon White Marble Coffee Table Top. This Marble Top Coffee Table catches your eye from every angle. 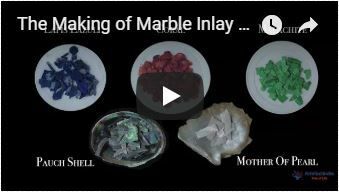 The semiprecious stone inlaid into the White Marble Top Coffee Table is Carnelian(Orange Red Stone), Lapislazuli(Blue Stone), Malachite(Green Stone), Jasper(Brown Stone), Mother of Pearl(White Shiny Stone), Paua Shell(Colorful Shiny) and Turquoise(Sky Blue Stone).